Earlier this year, a "mystery woman" in California took an old box of wires and computer parts to be recycled. Her husband had died not long before and she was clearing out the garage, she told CleanBayArea when she dropped the boxes off at its warehouse. The boxes then sat in the warehouse for a couple weeks until a recycling manager opened them up and started sorting through them - there, under piles of cables and old keyboards, glimmered an Apple-1 computer. 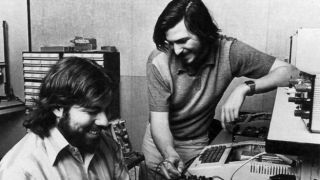 The Apple-1 was sold for $666.66 when Apple co-founder Steve Wozniak hand-built them in 1976 but they are now so rare that this particular Apple-1 went for $200,000 at auction. CleanBayArea is now on the hunt for the mystery recycler; there's a cheque for $100,000 waiting for her if she turns up. By rights, it should also turn out that one of the CleanBayArea employees involved is the love of her life so Nic Cage and Bridget Fonda should play them in the film.